The initial size of the log file is the larger of 0.58 MB or 25% of the total data files specified in the create database statement. For example, if you create a database with 4 separate files, it would increase the initial size the log file is set to. This would be different if you’ve changed MODEL database to set the default log and database size. When examining the results, you can see the zeroing of the log file, but not the datafile if you have instant file initialization enabled. The transaction log is divided into virtual log files. This helps the system manage the log file more efficiently. New VLF’s are inactive & not used. Note: In Brentozar Office Hours Brent talked about the common misconception of SIMPLE VS FULL logging. Most folks (guilty) think that SIMPLE reduces the amount of logging SQL server performs, thereby improving the overall performance. However, in a general sense this is a misconception. 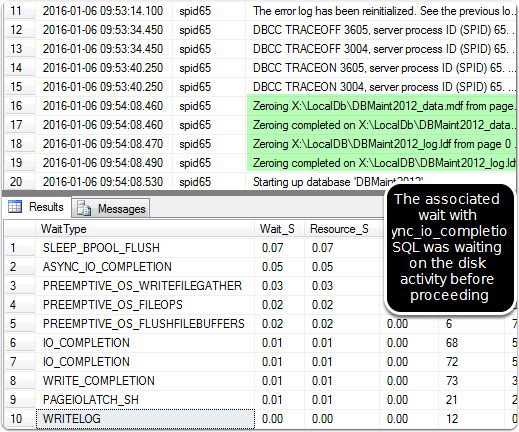 Logging, as previously discussed from my previous post on (101), is the core of SQL server, and required for transaction durability. The difference between SIMPLE and FULL is mostly to do with how the transaction log space is marked as available for reuse. SIMPLE: after data files are updated and the data file is now consistent with the changes the log has recorded, the transaction logs are now marked as free and available. FULL: all the transaction log records, even after hardened to the data file, are still used. This is what can cause the common issue of exponential log file growth with folks not aware of how it works. 300 GB log file on a small database due to now one watching? Been there? This is because the log file will keep appending the log entries overtime, without freeing up space in the existing transaction log, unless some action is taken to let SQL server know the transaction log file space is available for reuse. Marking the space as available is done by ensuring you have a solid backup solution in place that is continually backing up the transaction log in the backup set) thereby letting SQL server know that the transaction log has been backed up and space can be reused in the existing log file.